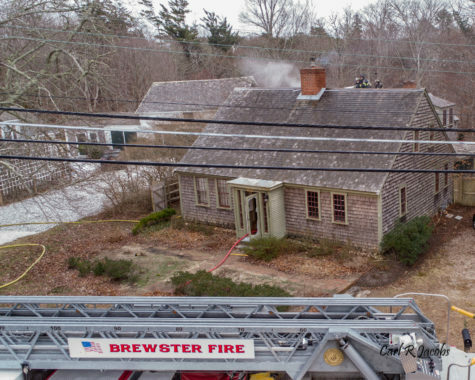 On Monday January 14 at 8:33 a.m. Brewster Fire/Rescue was dispatched to a reported structure fire at 2042 Main Street. 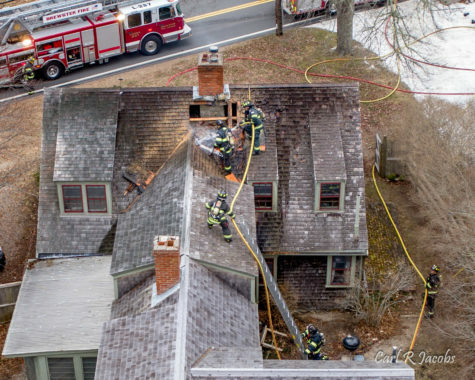 On arrival Deputy Chief Kevin Varley reported fire showing from the roof of a 2 ½ wood frame private dwelling and requested a working fire assignment. He then passed command of the incident to Chief Moran. All occupants were found out of the structure on arrival of the fire department. Brewster Squad 241 arrived on scene and stretched a 1 ¾ attack line into the second floor of the structure to extinguish the fire. Brewster Ladder 237 arrived and was assigned to place the aerial ladder to the roof and assist with fire extinguishment on the second floor. Brewster Engine 239 and Harwich Ladder 66 assisted with placing ground ladders to the building and the Harwich Engine Company was assigned Rapid Intervention (RIT). On arrival Dennis Engine 111 laid a supply line to Squad 241 and stretched an additional 1 ¾ attack line to the roof via ground ladders to assist with fire extinguishment on the exterior of the dwelling. A Dennis Fire Department ambulance stood by at the scene and the Eastham and Orleans Fire Department provided coverage in Brewster during the incident. Fire damage was contained to the roof and attic of the building and moderate water damage occurred on the first floor. The Brewster Building Commissioner and electrical inspector responded to the scene and determined the building to be structurally sound. Brewster Police provided traffic control during the incident and the Brewster DPW was requested to apply sand to several frozen water spots on the roadway. All Brewster Fire units were placed back in service at approximately 10:30 a.m.